The Shrewsbury legal firm has strengthened its position as one of the region’s top practices after its corporate and commercial team were recognised in the West Midlands by the industry’s leading guide, The Legal 500. The department appears on the much-coveted guide’s West Midlands ranking for the first time, joining the firm’s wills, trusts & tax, family, banking and finance, and employment teams on the list. Eight of Aaron & Partners' Shrewsbury-based lawyers are also included in this year’s guide, including new entries for Hugh Strickland and Stuart Haynes – both partners at the firm – who have been recognised for their corporate and commercial work. Strickland also heads up the firm’s banking andfFinance team, which moved up a tier in this year’s rankings, and he was lauded as “a steady pair of hands (who) guides clients well through difficult times” within the guide. Richard Barge, who leads the family team in the Shrewsbury office, was another new entry on the list and was praised for his expertise in high net worth relationship breakdowns and recommended for his work on pre and post-nuptial agreements, as well as cases with a cross-border element. Sandy Edwards from the same team was recommended for her experience of handling complex cases involving children. 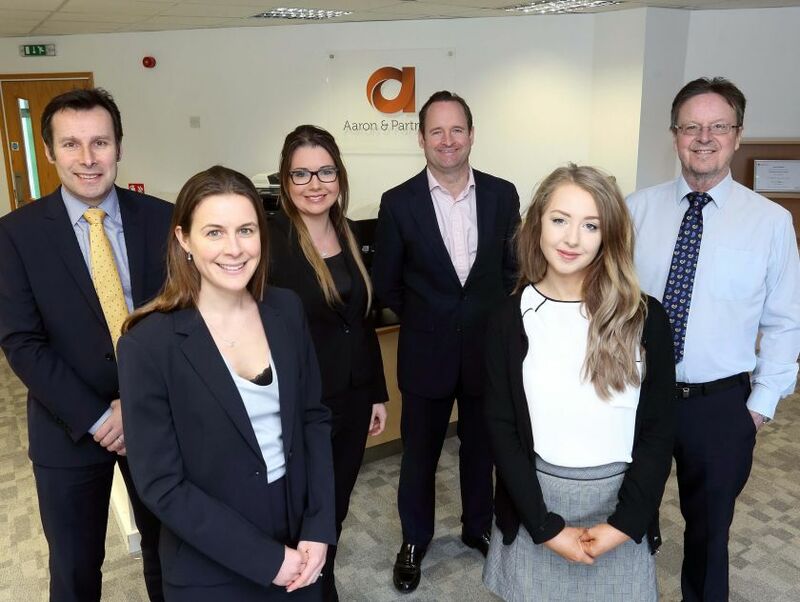 Aaron & Partners’ Shrewsbury-based employment team retained its place on the Legal 500 list and was highlighted as being skilled and “incredibly knowledgeable”. Partner Helen Watson, who leads the team, was hailed for her work on TUPE matters, large scale redundancies and trade union disputes. Ben Mason was also praised for his proactive and enthusiastic work ethic, and Paul Bennett retained his place on the list from last year. Senior associate Lynda Richards, who heads the wills trust and tax team in the Shrewsbury office, was rated as a “key figure” specialising in tax, trust, estate and succession planning for individuals and trustees. Stuart Haynes, who also heads up the Shrewsbury office, said: “The Legal 500 is one of the most renowned ranking directories in the UK legal industry. It’s a huge honour for so many members of the firm to be recognised. To be able to increase the number of individual recommendations and the listings in practice and sector areas year-on-year is something we’re really proud of. “This year our corporate and commercial team in Shrewsbury has been ranked for the first time and several of our Shrewsbury-based staff have been recognised for the first time this year, which is a testament to the quality of work being carried out across all our teams." Across the firm’s Shrewsbury, Chester and Manchester offices, 35 individuals received 55 recommendations, including two partners being awarded with the coveted ‘leading individual’ status, reserved for the country’s top lawyers. Aaron & Partners also received 17 team rankings – an increase from 2017 – and retained coveted ‘top tier’ status in three areas: corporate and commercial, dispute resolution and private client – agriculture and estates. The firm employs more than 120 staff across its three offices, in Shrewsbury, Chester and Manchester.